Tonight you had another "first" in your life, although to most it wouldn't seem like much. Your Daddy and I took you to Florida State University to watch the Marching Chiefs create this year's band at "March Over." Here, the new, auditioning band members - formerly known as gunkies, but now politically correctly referred to as rookies - are put through their paces in front of the returning veteran members, and then they get to join up with the vets. It's really a neat experience. I remember when I stood across from the vets. 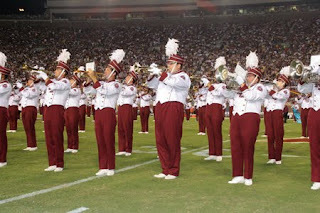 I had waited for that moment for a long time; I had grown up around the Marching Chiefs. Hmmm. Maybe I need to give you a little background information. You come from a musical family. On your Daddy's side, your Great Grandma Graves and your Grandma Brooks can play piano, and your Grandma Brooks can even play the accordion! Daddy plays the piano and the french horn, and your Uncle Kurt and Uncle Ryan play trombone and trumpet. Daddy and I actually met in our high school band at Leon High School. I come from a long line of band romances, as a matter of fact. Your Great Poppey and Great Grandma Davis met in their band. They marched drum and bugle corps together, and Great Grandma practiced REALLY hard to be able to sit next to Great Poppey during band class. They both played trumpet, and Great Grandma Davis was also a majorette. Your Grandma and Grandpa Davis met in Marching Chiefs. Grandma plays the flute and piccolo, and Grandpa plays the tuba. When I was born, Grandpa Davis was still in Marching Chiefs, and he performed at the football game that afternoon with pink balloons tied to his sousaphone. Like I mentioned before, your Daddy and I met in high school band. We both play French Horn, and I play piano as well. Even Uncle Brian and Uncle Gary played instruments! They both played tuba in their middle school bands, but once they got to high school, they both went on to play football and soccer. I, like your Great Grandma Davis, am a baton twirler, so during marching season, I twirled with the band, and then I played horn during concert season. When I say I grew up around Chiefs, I got to participate with the Alumni Band when I was younger when Grandma and Grandpa Davis marched, and almost all of my twirling coaches were current (at the time) or former Chiefs. It was such a big part of my growing up, and I can't wait to share it with you. I really wanted you to enjoy seeing the Chiefs tonight, and I really think you did. You sat so still when they played, really seemed to pay attention to Dr. Dunnigan as he spoke to the group from the Tower of Power, and you clapped at the end of their performances. You were prepared, though. We have been listening to Chiefs CD's in the car (a little loudly, so that you would be prepared for the experience), so I think that when we finally did get to marchover, you seemed completely at ease. Plus there were TONS of new people for you to smile at, so you were completely in your element. I know you will most likely not remember tonight, but I will. Being exposed to music and the Marching Chiefs really influenced my decision to take up a musical instrument and to learn to twirl. And I have to say, there is nothing quite like standing in front of, or being surrounded by, that wall of sound. It is awe-inspiring. I look forward to the day when you can understand and experience all of that, and I'm glad that we got to start that process of understanding tonight.